Free to try (50 species). In-app purchase required to unlock all 919 species. 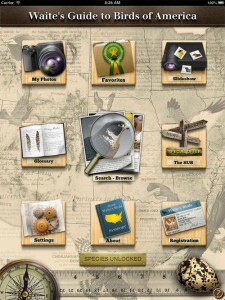 Waite’s Guide to Birds of America (WGBA) is the first high-definition field guide app designed from the ground up as a native iPad app (“native” means it only runs on the iPad). 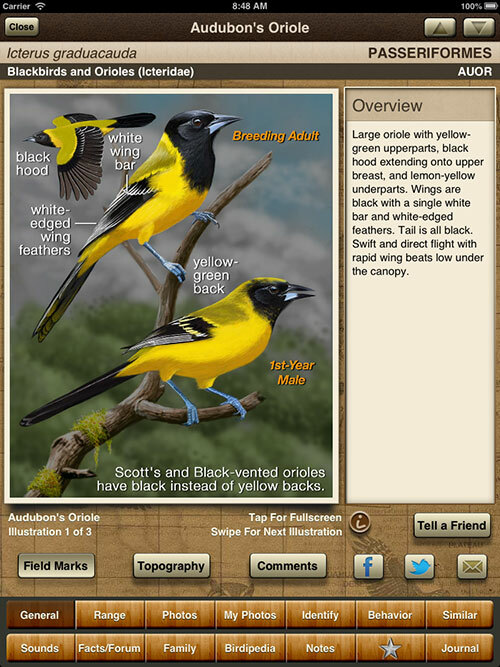 WGBA offers features that take birding to a whole new level including a patented search algorithm called SAVE, which results in lightening fast, fool-proof bird identification. Equally at home in portrait or landscape mode, both photographs and illustrations are all presented in high-resolution HD quality 1200 x 1500 px portrait or 1500 x 1200 px landscape. All illustrations have detailed field marks that can be turned on and off. 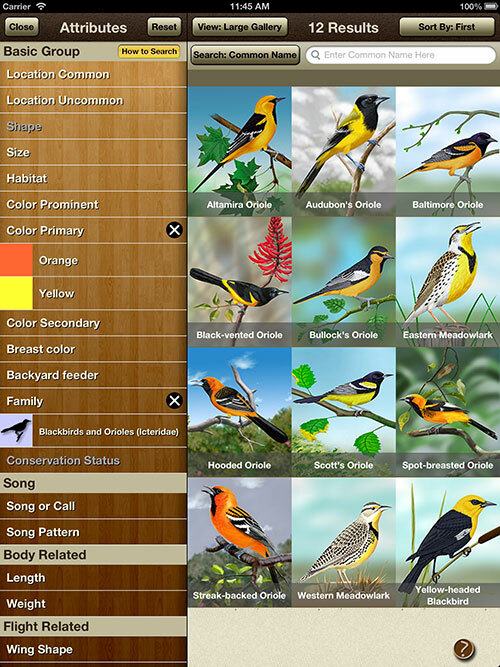 WGBA is designed for the birder who wants to learn everything about birds with a focus on identification. Sound and Call. Identify by the melody. Range map. Where can I be found? Species found. Audubon Oriole with field marks. Let the search begin. It's never wrong. Home. Your haven. Extraordinary High Definition Birding App Introductory Sale – unbelievable 50% off retail price – now $24.99 – marked down from regular price of $49.99. Smart Search Engine. Uses our patented Smart Attribute and Value Elimination (SAVE) algorithm, which results in lightening fast and fool-proof bird identification. Portrait and Landscape Mode. Works equally well in portrait or landscape mode. HD Illustrations. All illustrations are in high resolution: 1200 x 1500 portrait and 1500 x 1000 landscape. HD Photos. Hundreds of photographs are in high resolution. These have a special graphic icon identifying them to the user so they can zoom in and see the amazing details. Field Marks! Now all illustrations have a Field Mark layer that can be turned on and off. This is a great way to learn the important identifying marks for specific species. We even tell you what bird you might get it confused with. Topographic maps. All species have topographic maps, which show specific feather groups. We show head, body and flight groups. Zoom-able Images. All photos and illustrations are fully zoomable inside their frame and can be made full screen. Advanced Slideshow. Lets you select photos or illustrations, see just photos from specific photographers, and control what species you wish to study. Makes a great presentation of your portfolio. Upload Photos. My Photos allows you to import any photos and assign them to any species account. Demo the app for free! There is no Lite version of WGBA. When you download the app it comes with all 919 species, however 869 species accounts are locked and 50 species accounts are fully unlocked. The unlocked accounts let you view all the details including the illustrations, photos and songs. You can use the search engine and see the results, but you can’t open all species accounts, just the 50 that are unlocked. To buy the app you simply use the in-app purchase feature. Dropbox Backup. Backup you Notes, Favorites Lists and Photos to Dropbox. Six View Modes: standard Compact, Icon, Thumbnail and Gallery and two new modes Large Thumbnail and Large Gallery. Help Me Identify a Bird forum integration. 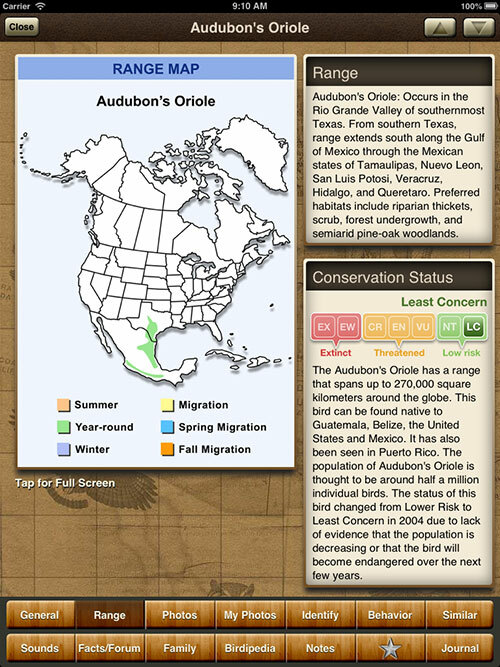 App connects directly to our whatbird.com forum where experts are standing by to help you ID a bird you can’t find with the search engine. Compatible with iBird Journal. 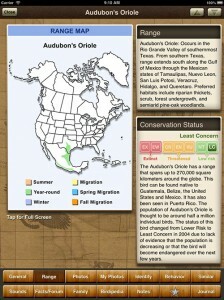 Directly links to iBird Journal app from any species page. Journal will open with the sighting form already filled out. You can embellish the form and return to the exact same species page you started in WGBA. 36 Search Attributes. More search attributes (38) than any other birding app! Zoom-able HD Images. All photos and illustrations are fully zoom-able inside their frame or can be viewed in full screen. Swipe left or right to go to the next image. Upload your Photos. My Photos allows you to import any photos and assign them to any species account. Six View Modes: Compact, Icon, Thumbnail and Gallery … and two new modes: Large Thumbnail and Large Gallery. Largest Audio Library available. 5 hours of bird songs and calls. We have 154 more species song tracks than any other bird app! Spectrographic Audio. 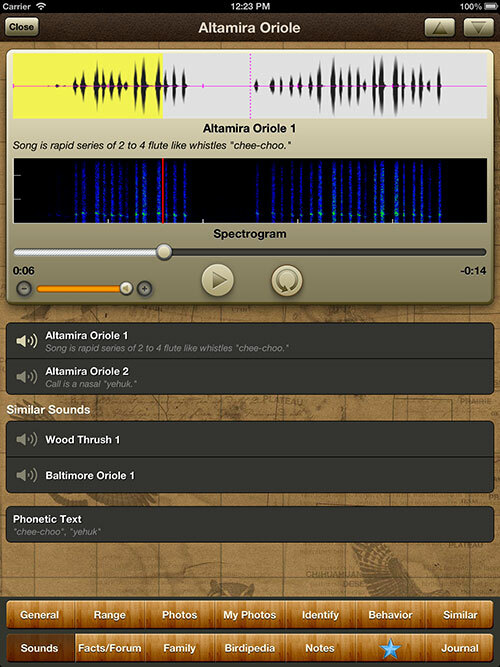 Unique spectrographic display brings insight to the structure of bird songs by allowing you to view the sound’s frequency components. A Beautiful Field Guide ★★★★★ Ever wondered what would happen if someone could combine the reference information of a field guide with the visuals of a coffee table-type art book? This app has pulled it off. It’s both a learning tool and a work of art. A few highlights: overlays so you can either view the field marks or turn them off and enjoy the unobstructed beauty of the illustrations, a highly customizable slide show feature allowing you to select individual birds/vocalizations for learning or review, and connectivity to a list app called iBird Journal. There are some nice elements of the interface. I like, for example, how the species name appears momentarily at the full-screen illustrations and then fades away. Once again, you’re left with the uncluttered view of the beautiful image. This might not seem like a big deal to everyone, but to me it’s another sign of the care the developers put into showcasing their extraordinary visuals. I haven’t used iBird Journal, so I can’t comment about how that works. But, the interface of his app is elegant, the illustrations and photos are drop-dead beautiful, and the amount of text information is substantial for a field guide and just right for a tablet. With the slide show feature, it’s hard to imagine a field guide app that coulud make learning more enjoyable. you may still leave your iPad at home when you’re out in the field. But, once you’re back home again, in a comfortable chair, you’ll have a hard time putting this one down. 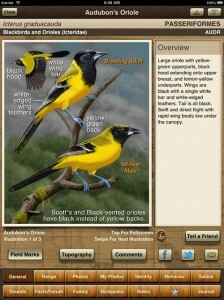 Awesome Bird Guide ★★★★★ Beautiful guide. Very user-friendly. Have only been using a day now, but I can already tell this will be a favorite. Lots of details. Slideshows based on user-defined lists. You can make any number of lists. Then you can run a slideshow based on the birds in your list! I am just starting to learn bird songs and this is exactly what I have been wanting. I can make a short list of birds I want to learn and run a slideshow to learn the images (based on photos) and learn the songs/calls at the same time. I think this will be extremely helpful for visiting a new area, where I hope to see some new birds. I can review images and calls of just those birds. I plan to listen to the slideshow in the car while driving to a new area. Great images and look even better on iPad in high resolution. Better searching with the elimination feature. No more searches with no results. Access to the User Forums. I have learned more about bird identification from this forum than everything else combined and it is great to have access directly from my iPad. There are a lot of features that you can read about. But I think these features really make this app worth the cost for me. Some have asked about the difference between this and iBird Pro and which to buy. I know Waite’s group has a good description for this, but in my mind if you are only gone to use an app for id in the field, get iBird Pro. If you are going to use the app for studying at home and have an iPad, I recommend WGBA, mainly for the above features. I own both because I want the convenience of a great app on my iPhone and the better features available in WGBA on the iPad. My only problem with the program is that I hope that iBird Pro will also get the upgrades including the Field Marks and the slideshows based on user lists. I know many of the new features are not very applicable for the iPhone and there is a good reason for a separate iPad app, but I would really like to see Field Marks and slideshows on the iBird Pro app.